This table will serve as an index of material related to the Baÿerls. Newly added material is at the top. Refresh your browser to get the most current display. 18 Dec Mehre Atle Karten von Edenried. 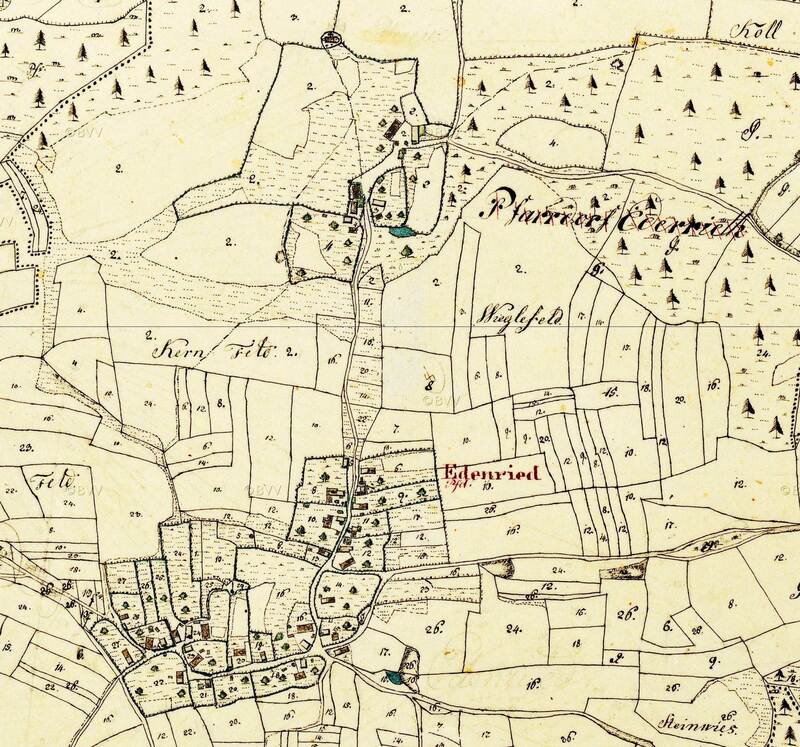 21 Nov Old Map Edenried from first half of 1800s. 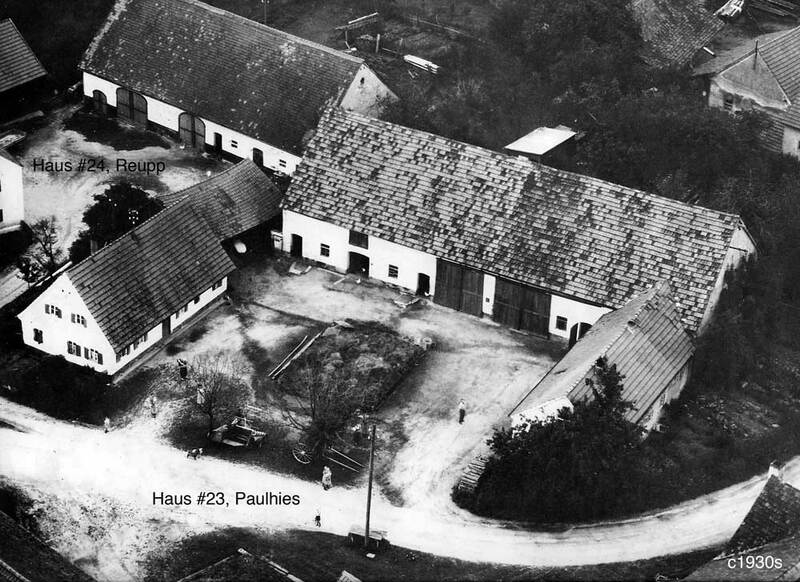 21 Nov 2014 Arial Photo of Bayerl Farms 1930s. 21 Feb Summary of known records for Maria (Mall) Bayerl of Gallenbach. 20 Feb The oldest Bayerl baptisms in Affing. Relationship not known. 29 Jan 2010 Begin a statistical analysis of Edenried Church Books. 14 Nov Nice old map of the Bayerl homeland taken from the Castle. Bayerl family gravesites. WWI Military records including those of Bayerls. 19 Apr Added records from Haunswiess and expanded Graphic Index. Found birth record of Martin Bayrl. 25 Mar Summarized preliminary observations about the Bayerls of Gundelsdorf with images of church records. 17 Mar Map showing Migrations of Baÿerls from Edenried to America with some links to supporting documents and discussion. I am still adding the latter. 14 Mar I placed a massive amount of information on the site related to the Baÿerls of Edenried. There is an overview and a Graphic Index to the records and discussion for each individual. 8 Mar Map showing Migration of Helfers from Bach to surrounding villages. 6 Mar Maps of the Bayerl and Helfer homelands. Political, Physical, and Satellite. 2 Mar Overview of the Helfers of the 1600s in Bach and surrounding villages with images of baptisms and marriages from Aindling church records. There is a lot of primary material here back to 8G Grandparents of Bach. 4 Feb Bayerl Family Registers from Affing: Leonhard b. 1852; Joseph b.1818; Sophia Bayerl Gnugesser and a more modern registry for Andreas b. 1814. 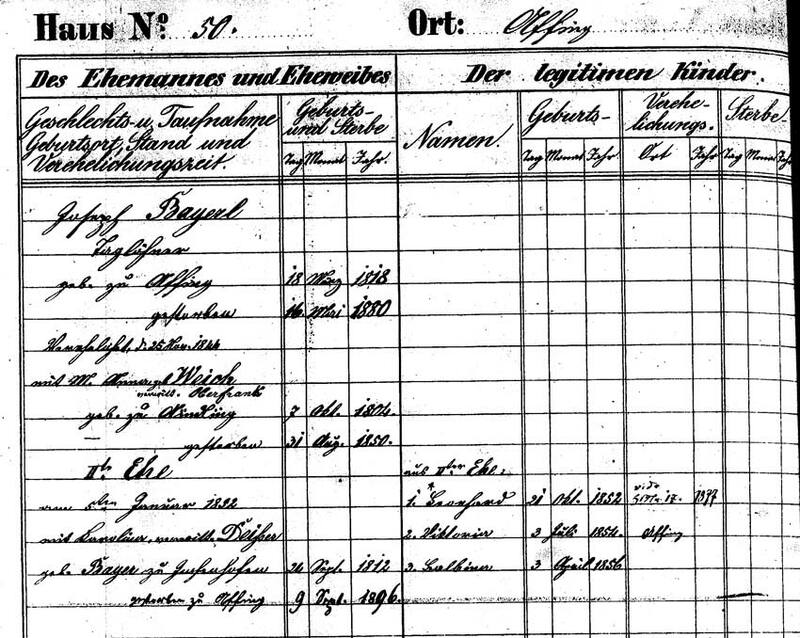 2 Feb Family Registers from Todtenweis: Xaver and Michel Helfer, and Dominikus Baÿrl. 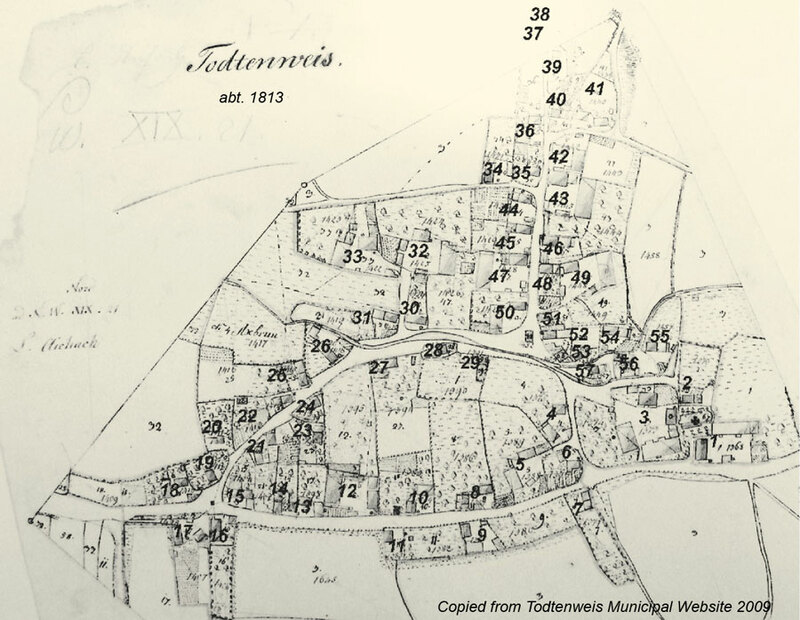 Map of Todtenweis from 1813 with house numbers. 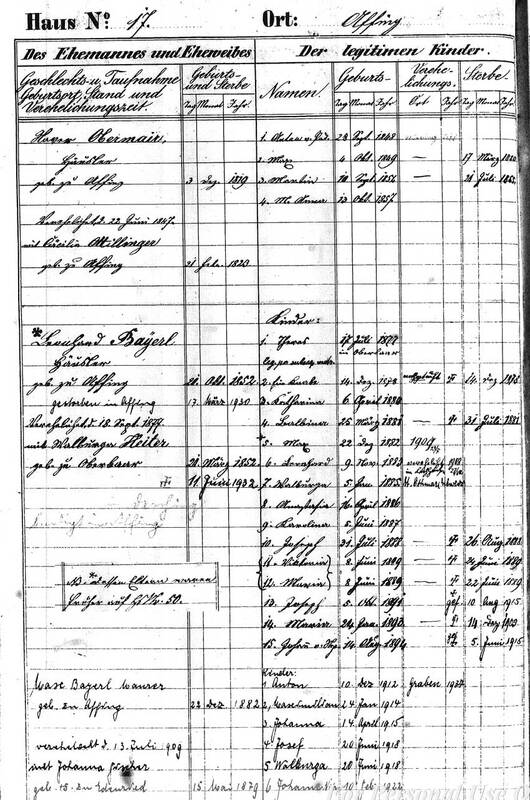 2 Feb 2009 Family Registers from Affing: Leonhard and Andreas Baÿerl; Maria Anna Baierl, Carolina Bayerl. Marriage records of Johann Bayerl from 1788 and Alois Bayerl from 1801. 27 Aug Introduction to the spelling "problem." Signatures of my relatives. 27 Aug 2008 Overview of my Baÿerl Family.